It’s not just representation. It’s misrepresentation. How ‘Crazy Rich Asians’ addresses both. Since the blockbuster hit Black Panther, the issue of representation has justifiably sat at the forefront of mainstream thought. The recent Hollywood romantic comedy ‘Crazy Rich Asians’ follow in the footsteps of the Marvel film but also subtlely crafted is the statement of misrepresentation that it makes. There is a scene in the movie where Ken Jeong’s character is introduced. You might remember Jeong as the hilarious figure in the hugely successful film series Hangover. Initially, you hear him speak in his familiar goofy Asian accent. But immediately after he breaks into an American accent (incidentally his real accent) and jokes that he doesn’t actually have an accent. At that moment, I, and probably many others like me breathed a sigh of relief. The movie had not resorted to cliché Asian accents for a few cheap laughs. But more subtlely crafted is the statement of misrepresentation that it makes. Now don’t get me wrong, there are some hilarious nuances of the Asian culture. Believe me, I’ve heard them all and have definitely laughed along. However, when the only portrayal of Asians in western culture is funny sounding accents, clueless Asian migrants, timid characters, and nerdy sidekicks, then there’s an issue. This perception of Asians being just comical or meek can create unbalanced outcomes. It may come in the form of lost job opportunities, leadership positions and even performance roles. Pressure to cast a white female actress lead in ‘Crazy Rich Asians’ was one such example. However, just as concerning is how this mindset is further reinforced by Asians accepting the status quo (I write about this in my last article). 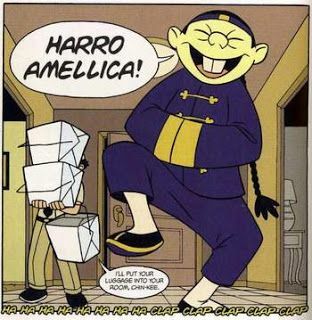 when the only portrayal of Asians in western culture is funny sounding accents, clueless Asian migrants, timid characters, and nerdy sidekicks, then there’s an issue. In ‘Crazy Rich Asians, for the first time in a long time we see Asians represented, but not in the usual sense. We see them playing the lead, the hero, the villain, the ally, the mentor, the companion, the joker. But ironically, not the Asian.